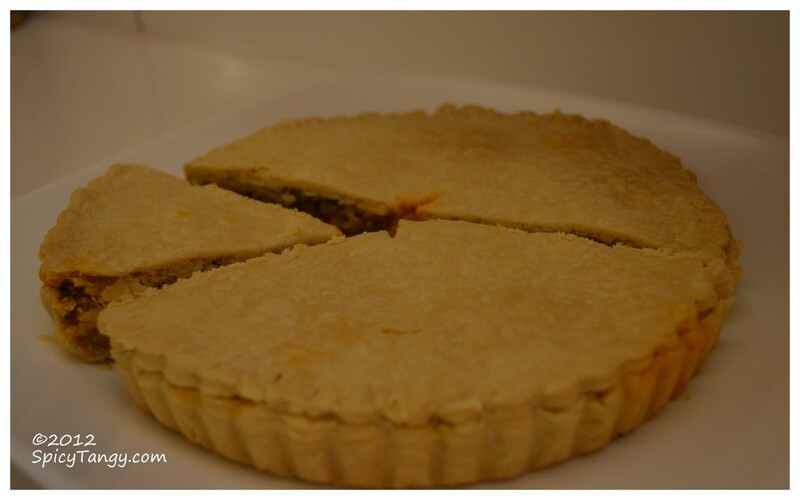 A simple and delicious pie with broccoli and lots of veggies. Steam the broccoli till it softens. You can use a vegetable steamer or microwave it for 4 minutes. Set aside. Heat oil in a pan. Add butter at the same time. When hot, add dried oregano and chopped onions. Saute till onion turns brown. Add capsicum, tomatoes, salt, ketchup, red chili powder and sugar. Mix well till tomatoes soften. Add the broccoli and lemon juice. At this point, check your seasoning and adjust if required. Take the flour in a bowl. Add butter. Mix the butter with your fingertips till the butter melts and you get crumbly flour. Add water and mix till you get firm dough. Do not knead too much. Cover and keep in the refrigerator for 10-15 minutes. Remove the dough from the fridge. Divide it into two pieces. Sprinkle some dry flour on the dough. On a rolling board, roll each piece between 2 sheets of polythene. Roll till it is evenly thin and about 8-9" in diameter. Your pastry sheets are ready. 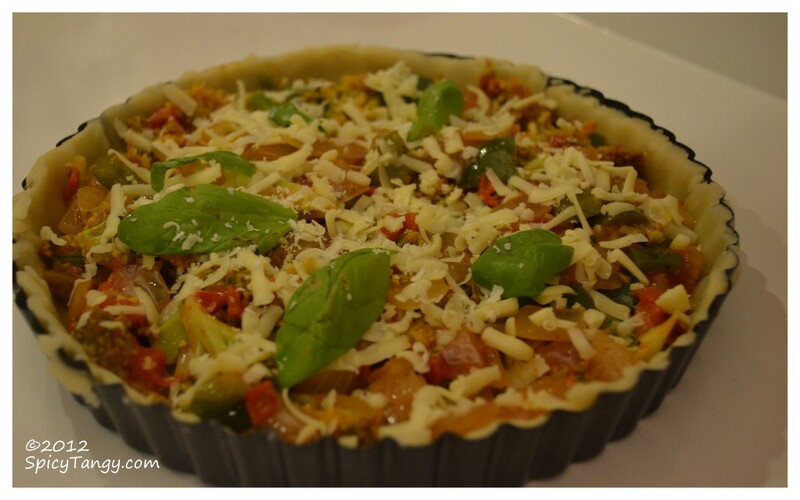 Take a 8" tart tin and grease it with oil. 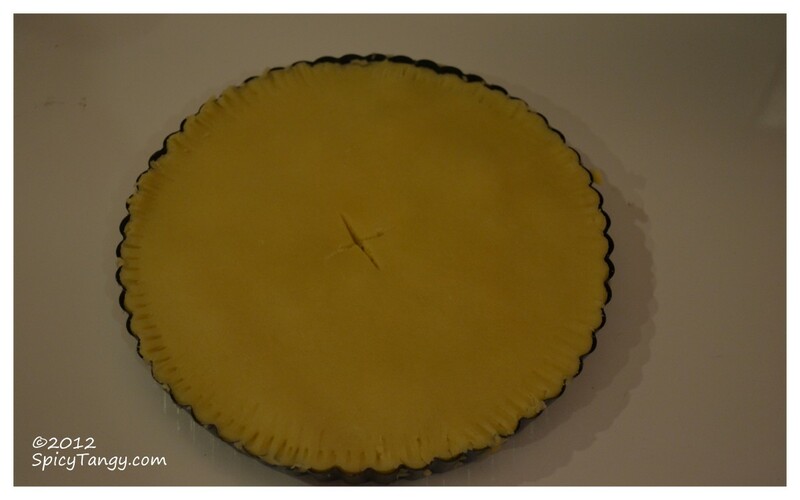 Place one of the pastry sheet on the tin and set it firmly against the edges. Do not prick it. Add the filling on top and spread it evenly. Shred the cheese over it. Add some fresh basil leaves on top. Place the second pastry sheet over it. Cut the extra dough and seal it by pressing with a fork along the edge. Make a cross at the center to let the hot air escape. Brush some melted butter on the top to get a nice crust. Bake for about 60 minutes in a pre-heated over at 200 C (400F). Remove from the oven and rest it on the wire rack for 5 minutes. Remove from the tin and cut into pieces. 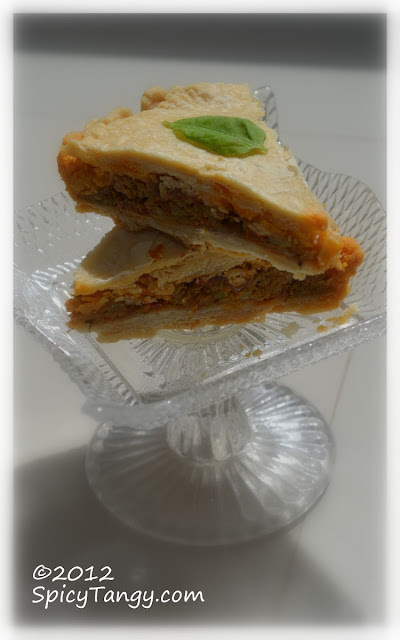 I made the broccoli pie on Sunday after reading the recipe on your blog. Only the difference was - I used wheat flour instead whole flour(maida)coz we don't find it much healthy. Awww Thanks so much for trying it and loving it :) I am really happy that you are regularly reading my blog and appreciating it :)) ! !